black bean chiles rellenos over a spicy sage romesco sauce with sweet corn pitas, originally uploaded by aarn! +28th January, 2009+. grilled six large poblano peppers and three medium sized red bell peppers over medium heat until the outside was charred and flaky and then threw them all in a paper bag to sit and steam for a while. after they had cooled a little, most of the skin was removed from all of the peppers (making sure to keep anything that looked flavorful [oils, some skin], no water used in this process). the stems and seeds were then removed from the peppers. the clean red peppers were set aside. the poblanos were split down the side and unrolled then stuffed with black beans, a thin slice of whole milk mozzarella, and a thin slice of gruyere, then rolled back up and placed spaced out on a baking sheet. when the time came, these were baked at 375-degrees for about 10-minutes (until they started to sizzle a lot and the cheese was obviously melted). in the food processor went (in this order): one clove of garlic, 1c. whole raw almonds, 1/2 of a large green habenero pepper, 8 leaves of fresh sage, juice from 1/2 of a lime, 1T. olive oil, the three skinned and seeded roasted medium red peppers, 1T. agave nectar, salt and pepper. blended until smooth. the corn pitas were made from 2 1/4 lb of a 50/50 mixture of finely ground cornmeal and high gluten flour, 1T. active dry yeast, 2-3T. olive oil, 2T. sugar, 2T. salt, 1T. agave nectar, 2 1/4c. of room temp water. let rise for 45-min or so, punched down, rolled out with a french rolling pin in some all purpose flour, then tossed on a 400-degree baking stone and flipped once until cooked through and crispy on the outside. 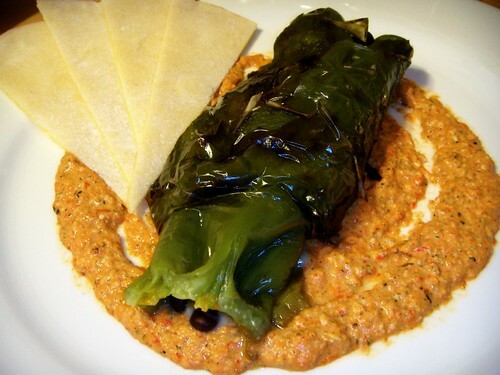 the baked poblanos were served over the romesco sauce on a warm plate with a wedge of the sweet corn pita on the side. maddie made a nice soup/stew with veggie chorizo, potatoes, kale, and some noodles, which went nicely with this dish. Whoa, this looks amazing. You have a talent.